Our enterprise has gained recognition in the industry for offering excellent quality Physiotherapy Ice Packs that are used during transportation and shipping purpose. 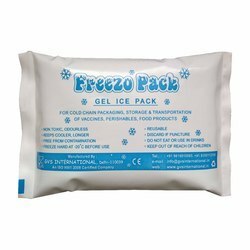 The offered ice packs are manufactured at our well established production unit by utilizing quality tested basic material and cutting edge technology under the guidance of our adroit professionals. Besides, we offer these ice packs in different specifications at market leading prices. Packaging Details: 72 pcs. are packed in 7 ply sturdy shipper. Looking for Physiotherapy Ice Packs ?